I’ve had a beautiful silk/cotton broderie anglaise for a couple of years, and couldn’t decide what to do with it. I had two pieces, for a total of about 2.5 metres or so. What to do? I can’t see myself wearing a dress made of this pretty fabric, although I really do like it. But I needed some tops to wear for the summer, so I opted for two, the first of which was Vogue 8392. And since it’s the Year of the Sleeve, I thought maybe I’d try that little trend, too. I underlined the top in a cotton voile, and bound the neck edges and opening with it. Then I thought I’d get fancy with the sleeves. I purchased a 5cm wide trim to add to the bottom of the sleeve, and cut one flounce to make it, well, flouncy. It was so pretty! And it looked like a box on me. Ugh. I dont’ know what it is about flounces, but I love the idea, and hate the reality of it on me. Maybe these aren’t just dramatic enough. Perhaps more flounces would have been better. But I don’t think it’s the sleeves that I dislike about this top. I’m sorry I don’t have photos of it. It was too horrible to photograph; I put it on, and took it off. I think it was the neckline. This is the second garment I’ve made with neckline pleats, and I just don’t like them. The first one is this dress, and I haven’t worn it at all this year because I just hate how the neckline pleats add more bulk and volume above my chest than I’m comfortable with. I was rather disappointed. I had hoped this would be a pretty top that I would like to wear. I’ve taken the flounces off the sleeves and put it aside for the thrift shop. Perhaps someone else will think it’s perfect. So, on to the next blouse, which I’ve made before out of silk chiffon, and quite liked. I did not bother underlining this. I also cut the tie a bit in between the suggested lengths and considerably narrower than either version. This is with my previously-blogged pleated trousers. I used French seams throughout the construction. And, just to see if it’s really possible to tell the difference between a pair of brown capris (unblogged) and a skin-tone camisole, I took this picture. I was pleasantly surprised that slight differences in under layers won’t be too noticeable. I love that eyelet. I haven’t had a chance to use it myself yet. I shall have to keep my eyes open for fabric and a pattern! 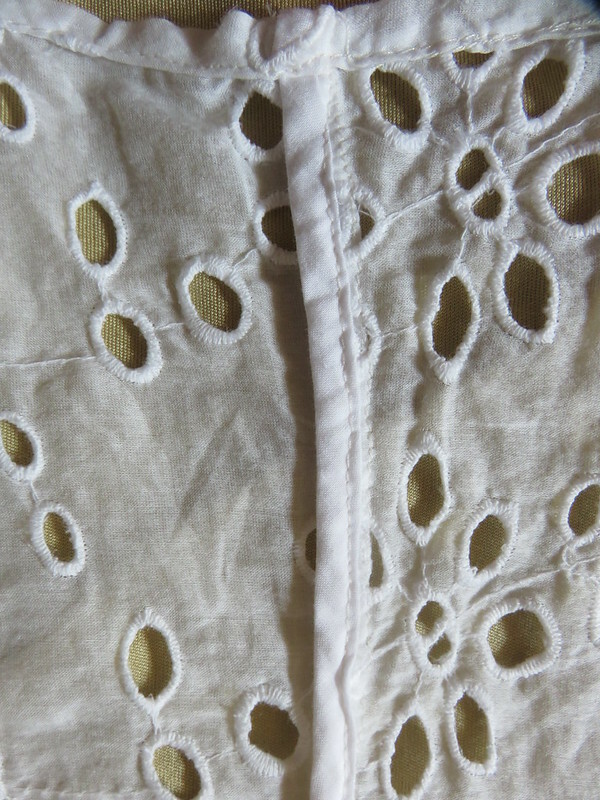 The flounce may have worked if it were lighter and more drapey but eyelet has a mind of its own! I shy away from rounded necklines and pleats/tucks to add volume and bulk. Less fussy styles work better on you and allow your beauty to shine through.Good job! Gorgeous. There is just something about white broderie anglaise that speaks of summer to me! Absolutely love the blouse on you. Total bummer about the sleeve flounce version…. I know all too well the frustration of a style being ‘in’ and having it not work for me! And your smile says it all. Isn’t it lovely when we make something and just know we will wear it forever? The fabric is lovely. really pretty. I have made a few things with this type of fabric and come to the conclusion that even though it is cotton and lightweight all the embroidery makes it stiff. so perhaps more shaped styles work better? Good point. I have heavier broderie anglaise in my stash, which have more fitted designs planned to go with them for just that very reason. I have that Vogue pattern out and now am wondering if I should use it? The second top looks great on you. It’s worth a try. I think the underlining just made the top too boxy. Oh, I like neckline pleats! Never thought about adding bulk, though. The second top is really pretty, super fabric. And those brown capris are so cute with the little tab near the hem. Will you be blogging about them? Soon! They’re part of a larger set of makes. One winner – and you learned a lot from the first one even if you didn’t like it. Nice job. I really like the detail of the neckline tie. Like you, I’m not crazy about neckline gathers. I also find that bell sleeves don’t suit me. I’d like to try the ruffles trend, but judiciously! The second blouse is lovely.